In this fast-paced knowledge trivia game, your aim is to dazzle the opposition with how much you know (or don't know) about the world we live in. From the day-to-day, to the truly bizarre, this truly entertaining game requires everyone playing to ask one simple, but very important question: is it a Fact, or is it Crap? You'll dazzle your friends with your limitless knowledge about the world we live in as you collect tokens for every correct answer. Watch out for the madcap Rush Hour where you can earn double points (if you can stop laughing long enough to answer the questions). So put on your thinking cap and get ready to play! 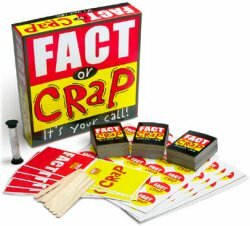 Each edition of the Fact or Crap game contains over 200 question cards, 64 Rush Hour cards, 16 Answer cards, 1 timer, 185 Fact or Crap tokens, 7 Fact or Crap hand signs, and an instruction sheet.